add the HP Latex 560 to its Charlotte location. Charlotte, NC – (6-13-17) Charlotte’s leading sign company adds another wide format printer, the HP Latex 560. 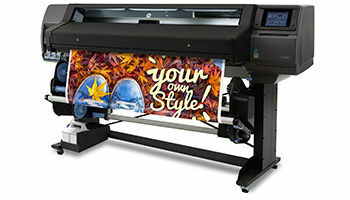 The 560 utilizes water-based HP Latex Technology, delivering a combination of true application versatility, high image quality and high productivity. The HP printer provides a sustainable approach that works great for Heritage operators and the environment. With print resolution, up to 1200 x 1200 dpi and maximum print speeds up to 980 ft2/Hr., the HP Latex 560 roll to roll printer produces full-color, vibrant banners, displays, wall graphics and interior lobby signs at incredible speeds. Heritage Custom Signs is highly active in the production of signs, displays and event banners for the Charlotte-Mecklenburg areas, the east coast and many national customers too. The addition of the HP 560 brings the wide-format printer count to 8 full-color machines. “The 560 compliments our 360, it’s faster and has a higher print resolution. We can now produce large orders faster, without any compromise on quality,” said Brent Thompson: Heritage Production manager. “The HP 560 is a great addition to our impressive arsenal, especially the vivid color profile, the new take-up system, and the improved curing system” said Tony Conner: Production. Heritage Custom Signs are a subsidiary of Heritage Printing & Graphics based out of Charlotte, NC. With a highly motivated staff, equipped with leading edge technology, Heritage Custom Signs is positioned to serve the east coast with quality event and interior signage and custom displays.